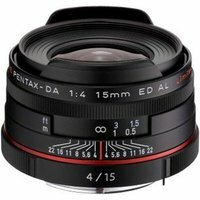 The Pentax 15mm f4 ED AL Limited Lens Black is a prime lens designed specifically for use with Pentax digital SLR cameras that feature a K-mount. The wide-angle 15mm focal length (23mm equivalent in 35mm film format) is ideal for photographers shooting landscapes, group shots, night scenes and general purpose travel photography. With its large f4 maximum aperture you can shoot in dark environments handheld at a low ISO, use faster shutter speeds and create beautifully sharp images with a smooth natural blur. The high-grade High Definition (HD) multi-layer lens coating delivers good light transmission and as a result the images are sharp and clear with lots of contrast. The Pentax Limited series lenses are renowned for their hand-machined, well-built aluminium body, outstanding image quality, HD coating and a round-shaped diaphragm for a beautiful out-of-focus effect.